The Last Wind-Up is a comprehensive repair facility. We are able to service and repair nearly all mechanical and electronic watches. 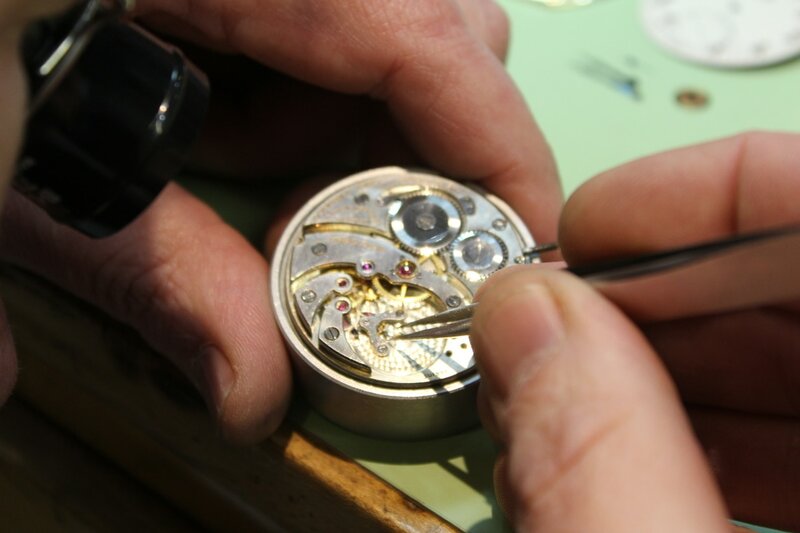 As a watchmaker with over 30 years of experience at the bench, Dave Berghold, the owner, has at his disposal a wealth of knowledge about the repair and restoration of watches, especially antique timepieces. Specializing in American, Swiss and English timepieces, Berghold is fluent in the mechanics of most watches made in the aforementioned countries and is able to repair and restore the complex mechanisms to like new condition. Be it a modern Rolex, Omega, vintage American railroad watch or a classic English verge escapement fusee watch, the necessary parts, if not readily available, can be manufactured by hand. The Last Wind-Up is currently an authorized repair facility for Limes Watches and Archimedes Watches of Germany. The repair facility is a combination of both antique and modern tooling. With a huge assortment of vintage parts, many dating from the early 1900's, the facility is well equipped to be able to fit the necessary parts to nearly any watch offered for repair. Whether it is an original glass crystal for a family heirloom pocket watch or a full restoration of a wrist watch with missing parts, it is a personal challenge of the owner to see that the watch be brought back to a fully functioning timepiece that will last for generations. We invite you to inquire about our repair services. We offer highly competitive prices on the repair and overhaul of watches and offer a liberal one-year guarantee on workmanship. Parts such as crystals, mainsprings and the like are not covered. Misuse, including subjecting the timepiece to hot-tubs, Jacuzzis and excessive depths in water are not covered. All parts used are genuine unless fabricated in house. If you have any questions or concerns about sending an item through the mail, please do not hesitate to contact us and we'll offer you the best methods of shipping your watch with the utmost security. If you choose not to accept our estimate, the watch will be returned to you. Your only cost is the return shipping and insurance. As a life member of the National Association of Watch and Clock Collectors and former Chapter 115 president, as well as a long time member of the American Watch and Clockmakers Institute, the integrity of workmanship and customer satisfaction is our foremost goal. Feel free to contact Dave Berghold personally. As owner of the company, he takes pride in answering all emails and inquiries directed to him on behalf of The Last Wind-Up. In 1990, Dave Berghold purchased Bozeman Jewelry and re-opened the store front as The Last Wind-Up on the day after Thanksgiving as the sole proprietor. Dave Berghold became captivated by horology (the study of time and timepieces) while attending South Kent School under the tutelage of Adolph Amend Jr. (one of the earliest of NAWCC members). Over the years, Dave developed a strong sense of not only the mechanical intricacies of timepieces ​but also the historical significances and subtleties of watches and clocks. 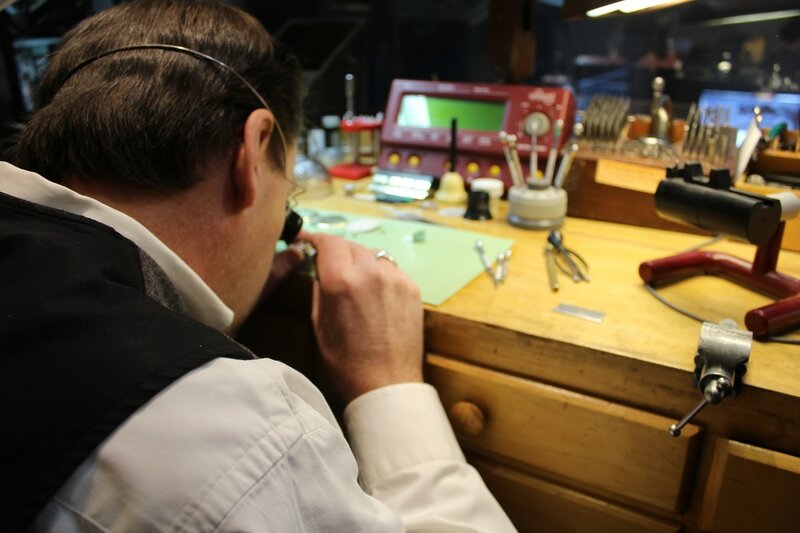 Now specializing in the repair and restoration of watches, Dave is capable of working on and restoring nearly any timepiece, be it from the 1600's or a modern timepiece. ​As a life member and past local chapter president of the National Association of Watch and Clock Collectors and a member of the American Watch and Clockmakers Institute, Dave is in contact with the current historical and mechanical developments of the industry. Having apprenticed in London, England to a classically trained watchmaker, served an internship at Christie's Auction House, New York, in the Watch and Clock Department, and having always maintained a substantial library of technical references as well as auction catalogs and price guides, as well as attending watch and clock trade shows, Dave has been able build a strong understanding of the industry and offer his expertise to his customers. ​​In January 2011, The Last Wind-Up moved to 11 East Main Street. A larger space for the retail operation, room for watchmakers benches, and the whole staff focused in one location will provide our customers the best service that we can possibly offer.